I owe a debt of gratitude to my sweet brother, Keith, who has loaned me his laptop computer because mine is in the shop for repairs. What a sweet guy! I had no idea how I was going to fill orders for the next several days. Anyway, I wanted to share a new "Eat Cake" painting that I finished last week and couldn't get listed due to computer problems. I added this painting to my eBay auctions this evening. This painting is 8" x 16" and has a brown ribbon with pink dots tied around the edges. You can click on the images for a closer view. I'm a finalist in the eBay group "Artists' Choice Awards 2008" for the Folk category! Wish me luck because I need it. I'm honored to be nominated along with the other very talented artists in this category. Thanks to all those who nominated me! Oh I just LOVE this piece! This is the perfect kitchen art! Congrats on your nomination, Catherine! Congratulations on your nomination! Your painting is perfect as always! Goo guy, your brother. Lovely painting and I do wish you luck!! Love the Eat Cake painting! And Congrats on being nominated for that award. I know you will win! Congratulations! This is certainly well deserved, Catherine! Your brother is a sweetie. Laptops are a little like cars...one hesitates to loan them out. Congratulations! I just found your blog and am falling in love with your paintings! Love them! Catherine, good luck and I hope you win the award! I love the Eat Cake painting! Thisis a wonderful painting! I like the tilting cake....sort of like the ones I make! LOL! Congrats on being a finalist! I hope you win. Ow Catherine, I love this one..so whimsical and wonderful!!! I hat it when my computer breaks down...I would almost rather be without my tv then my access to the internet. I'm so proud of you! Your luck is your awesome talent! I love your art! 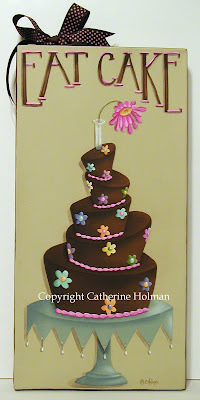 Love this whimsical cake painting! Congrats on being nominated for the Artist Choice Awards! I will be praying that you win!!! Congratulations for the nomination, Catherine! I love the painting! THAT is adorable. I love that painting! Wishing you the best of luck. You are most deserving of the nomination.